With time the enormous bit of the market is pre-involved by various mobile phones and working framework. It ends up fundamental to build up a versatile application that is usable on every one of the gadgets by utilizing a solitary code base and giving the applications a native feel. The root of the development of the mobile app is in the traditional software development but the objective of every mobile app is to develop a software that makes use of unique features and hardware of different mobile devices. An ideal mobile application is the one that is designed to give optimal performance according to the mobile hardware. This is quite easy in case of iOS devices as it only requires versions of the application for the iPhone and iPad to make it universally useful. But all other smartphones and tabs have different hardware or varying version of the same operating system. A mobile platform that will be used for the development, deployment, and the management of different mobile apps. To develop a mobile app, developers come across various choices like developing mobile app suitable for cross-platform, developing a native app, and developing cross-platform while staying native. 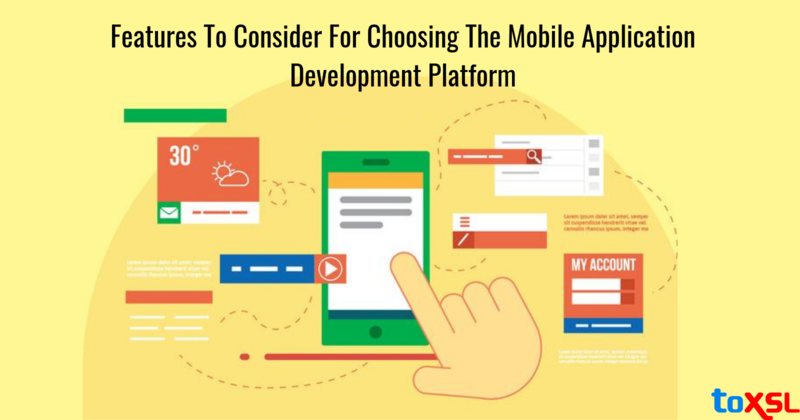 This options often leads to confusion and therefore it is important to consider a few important factors before developing a mobile app. Integration With Third Party System: The mobile application is effective if it easily integrates with different third-party technologies and tools. Along with seamless integration, it is important to ensure that the app supports mobile app management. This integration should be extended to different existing back-end systems and the continuous delivery infrastructure. Integrated Development Environment (IDEs): While analyzing a mobile application development platform it is essential to consider all the available options, future of mobile app and the ways for its updation that would be able to meet its future needs. Some platform offers modern IDEs that easily get installed on developers' machine while some other platform uses web-based plugins and tools that can be connected to third-party IDEs. Security: While choosing a mobile application development platform it is essential to look for compliance with industry standards, data encryption capabilities and other system monitoring to offer multi-level security for mobile applications. Also, it is important to consider different problems that may arise while integrating the mobile application platform with security and other enterprise systems. Audio and Video Processing: Video and audio channels is the most interesting feature of any mobile software application. It is therefore essential to choose the platform that supports high-quality video processing and ensure the best activity of the app. Usability: The mobile application development platform should be user-friendly and highly intuitive. The platform should work in the way as per the developers need that help the team to work together to create the whole cycle. Integration with ERP and CRM: The mobile application development platform that can easily integrate ERP or CRM software enhances the functionality of the mobile application and is, therefore, the basic requirement for developing a mobile application. Cost: It is good to choose the cloud-based services that reduce the overall cost associated with licensing development tools, required infrastructure, development cycles, and deployment of any mobile app. The seamless and productivity of any mobile application is highly dependent on the mobile application development platform. It is therefore very important for the developers to think smartly and invest time in building an efficient app that brings better and long-lasting results without facing many challenges. To get a highly effective mobile app development services at an affordable price get in touch with our skilled developing team and experience a great advancement and featured application development process.